Or, get it for 6000 Kobo Super Points! Britta is an outcast. Her entire life she has only had one friend, Cohen, her father's apprentice. Britta's father teaches her everything he knows, training her and Cohen to be the best trackers in the land. After a tragic accident, however, Cohen leaves, and Britta is left friendless and with no one to rely on except her father. Unfortunately, when we meet Britta at the start of Ever the Hunted, her father has been murdered, and as an orphan who is viewed as illegitimate, she is about to lose everything. Until she receives a proposal that could change her life - track and capture her father's murderer and she can keep her land and remain free. The only problem - Cohen killed her father. Doesn't this sound like an awesome plot? I thought so; I was so excited for Ever the Hunted and was ready to go on a wild adventure. However, the book fell very flat for me. The entire synopsis happens within the first 50 pages of the book, and then...not much happens after that. There was a little bit of excitement that developed in the plot about 200 pages in, but that's a very long time to wait for action. So, if there wasn't much going on in the plot, what was happening for the entire book? For that answer, we have to discuss the characters (namely, Britta). Britta is the most special of the special snowflakes. She has magical powers that she didn't know about until one day she suddenly performs magic. But Britta doesn't seem the tiniest bit concerned about the magic she just created, because she spends the ENTIRE book wondering why Cohen doesn't like her. She is supposed to be tracking her father's murderer, and yet on every other page, she is getting distracted by Cohen's smell of masculinity. Yes, that is actually how his scent is described - whatever that means. Britta is weirdly obsessed with Cohen's scent, which is described about a hundred different ways throughout the book. And she is constantly doubting herself and wondering what she did to keep Cohen from liking her, when he is CLEARLY in love with her. It seriously could not be more obvious. Britta's constant whining really bothered me as I was reading and kept me from caring about the characters or what was going on in the plot. Ever the Hunted was well-written, but it's nothing we haven't seen before. It is full of classic fantasy tropes that we see over and over again in YA fantasy. That doesn't make it bad, it's just not very unique. It could still be an entertaining read, as long as you don't go into it expecting to be taken on a wild ride. 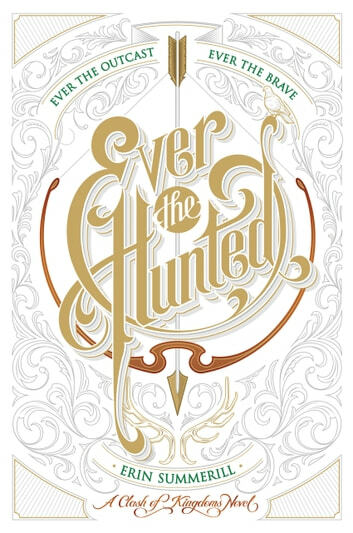 Ever the Hunted is focused way more on the romance aspect than on the fantasy adventure. If you like kissing books, you may like this one a bit more than I did. I wanted an epic story, and I got angst, angst, and a heck of a lot more angst. There is something else I need to mention that I noticed as I was reading. Ever the Hunted has a complete lack of diversity. Every single character who has their skin described is white. The only mention of any skin that wasn't pale was one little comment about the people living further south having slightly tanned skin because of the sun. That's it. Everyone is white. There was also a point at which a character scoffed at the idea of women being together. Full disclosure: Britta had asked if two Channelers (people with magic) could produce a powerful child. She was laughed at because all Channelers are women, so they obviously could not be together. Of course, it is true that two women cannot produce a child together, but the way this situation was handled in the book didn't sit well with me. Ultimately, if you are a big fantasy reader, I would not suggest Ever the Hunted. Maybe if you haven't read much fantasy, you will enjoy it. But if you read a lot of YA fantasy, you have probably read this book countless times before. Also, if reading diversely is something that is very important to you, you will probably want to pass on this one. As for me, I don't think I will be checking out the next book in this series. I actually wasn’t sure about this book. I saw this a few times on YouTube and around social media and fell in love with the book cover. I know not to judge a book by it’s cover...but I am big sucker for books with hand lettering for the design. I also love fantasy and stories where characters go on a quest. I really enjoyed this book in fact it was so good that I read it in three days. It was fast paced and had tons of great action. I also appreciated a main female character who was strong and clever. She knew who to get out of horrible situations and never let anyone tear her down. I also enjoyed her interaction with the other character Cohen who is her friend and who was accused of the murder. I thought he was a really interesting character and the opposite of Britta who tends to be on the rational side. Lastly, I enjoyed getting a quick glance at the world building. The world that has medieval elements along with magic. I totally recommend this book to anyone. *I received a copy of this book from the publisher in exchange for an honest review. This does not affect my opinion. * Ever the Hunted gave me absolutely everything I was expecting and wanted from this read so I'm a very happy book penguin (I'm making this a thing now...just let it happen)! The first thing I wanted from this book was an adventure. The synopsis promises that Britta much go on a quest to find out who *really* killed her father; it definitely delivered. She travels across dangerous stretches of land where her safety is not only not guaranteed but she's also a very direct and obvious target. Also to be kept in mind is that being out in the wild is scary so there was definitely an exciting sense of "must survive" to it. While there wasn't as much magic as I would have liked (but let's be serious, I can never get enough magic so that's an unattainable goal) I did like how it was worked into the story. It was very reminiscent of a few of some of my favourite magic systems in fiction (especially ones I've read in the last year or so) so it lent a sense of familiarity to this new story as well. I'm excited to see how it develops in the next book! Finally, I was really hoping Britta would be my most recent favourite type of kickass female lead. She definitely is! She is skilled, resilient, has (generally) good instincts, and isn't afraid to go after exactly what she wants. Britta is also flawed which I think is so key to great leads. I love when a female MC is imperfect but still strong and admirable. Correct me if I'm wrong but no woman is perfect but that doesn't mean she can't be a total badass as well. Britta's growth is another thing I'm excited to see unfold in the next book! 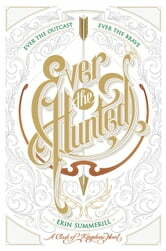 Ever the Hunted gave me magic, an exciting journey, and a great female lead. I definitely recommend if you're looking for a magical adventure.